On Tuesday, April 10, at Chelsea District Court, the courtroom was filled with people who had arrest records as long as the Declaration of Independence. They sat at the tables where defendants usually sit. They’d all been there before numerous times due to their addiction, drug use and petty crimes. This time, though, they were there to graduate – to acknowledge that they’d completed a program at least 18 months long with the courts that helped them turn their lives around. The program is Drug Court, and it was innovated in Chelsea in 2000 and continues strong through the support of judges, probation officers, recovery coaches and other resources. It is a last stop, last chance for many people who have been in and out of jail for their entire lives. On Tuesday, seven people graduated from the program. Most had been in jail several times, had years or decades of court involvement. This time, though, they changed that trajectory. Most had been clean for more than a year, and most were employed. Families and supporters came to celebrate. SJC Justice David Lowy was the keynote speaker, sharing how he had lost a cousin last year to opiate overdose. Almost all of the big players in the state’s judiciary were in attendance. Everyone cried, but they were tears of celebration and relief. Chelsea started and innovated the program years ago, and now there are drug courts in many of the urban District Courts that are built on that same model. It is a strike against the opiate epidemic, and one that works for many people. Anyone in Greater Boston who got a rose yesterday on Valentine’s Day likely had that rose pass through the New England Flower Exchange in Chelsea. Chelsea Florist Valerie LaCount of Washington Park Florists said having the New England Flower Exchange in Chelsea has made life much easier for her business, especially this week on Valentine’s Day. The Exchange moved to Chelsea last March from Boston’s South End after 50 years in that location. It was the first Valentine’s Day rush at the new facility for the wholesalers and their many customers from all over New England. In a formerly vacant warehouse on Second Street, the hub of Valentine’s Day – and every other flowery occasion – has been established. The New England Flower Exchange on Second Street virtually handles about every rose that ended up in the hands of lovers on Valentine’s Day. This past Monday, the Exchange was brimming with activity, as it was the last possible day for the nine wholesalers in the Exchange to get their product out the door to local florists, who in turn provide the necessary flowers, vases and accompaniments to customers for the big day. It was the first Valentine’s Day holiday for the Exchange in its new location, after having moved from Boston’s South End (where it was next to I-93 and called the Boston Flower Exchange) after 50 years last March. For local florists who have been long-time customers of the Exchange in its former South End location – such as Valerie LaCount of Washington Park Florist on Eastern Avenue – having the Exchange in Chelsea is a relief. That was particularly true this week as it was the first Valentine’s Day where she didn’t have to wade through traffic on the Tobin Bridge and downtown Boston to get to her flowers and supplies. 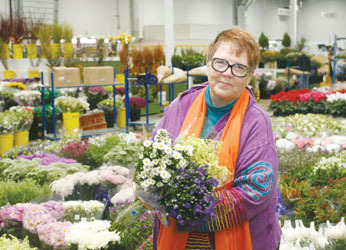 Paula Parziale, a long-time general manager of Berkeley Floral Supply – and an Everett native, said Valentine’s Day can be a challenge for a wholesaler. The New England Flower Exchange is a wholesaler, much like many of the fruit and vegetable dealers in the neighboring New England Produce Center. That means the general public cannot waltz into the facility and buy directly from any of the business there. However, anyone with the proper floral credentials can establish an account, and most every florist in the area does their shopping at the new Exchange – which sources most of its flowers from Ecuador, the United States, Colombia and Holland. Many of those growers begin growing to supply wholesalers at the Exchange right before Christmas – meaning that the flower’s journey begins long before February. LaCount said many consumers think that the flower industry engages in price gouging at Valentine’s Day, but it’s not the case. Instead, she said the growers have to sacrifice two or three crops to provide the volume needed for the American Valentine’s Day. That special circumstance comes at a premium cost, she said, for the wholesalers. Meanwhile, the major story besides Valentine’s Day at the new Exchange is the move that they made last year. The Exchange began its build out in mid-December 2016 after their old location in the South End sold to the Abbey Group to be developed into about 1.5 million sq. ft. of premium high-rise office space. The former Exchange had been in that location for 50 years, but the development push on what had become prime property was too strong. On March 1, 2017, nine of the wholesalers made the move, with one staying in the South End area and another closing. Several, such as Carbone, moved over their operations, but also significantly expanded their offerings of vases and other accessories. A new wholesaler of vases from New York has also been added. But the major message is that they’ve found success, and stayed together. Parziale said one of the best parts for her has been keeping the wholesalers together. The floral business, she said, is one that doesn’t change much, and many of those in the wholesale and retail markets tend to become like family over the years. There had been a threat that everyone would split up, but the new Exchange has prevented that, she said. Bob Hall of Kelley Wholesale Florists said they were also concerned in leaving the South End, but as it turned out, the concerns weren’t warranted. Janina Cupp added that the City of Chelsea has been wonderful in the transition and the build out. Had it not been for the cooperation, she said, it would have been much more difficult. City Manager Tom Ambrosino said he was glad to have the Exchange in Chelsea. Chelsea Florist Valerie LaCount talks over her order while Chris Birch of Cupp & Cupp Corp. wraps up a Valentine order. On Valentine’s Day in the New England Flower Exchange, Everett native Paula Parziale of Berkeley Floral Supply said it’s one week of chaos and careful preparation. The new Exchange celebrated its first Valentine’s Day in its new location on Second Street. The Exchange moved last year from its long-time headquarters in Boston’s South End. At the New England Flower Exchange on Second Street, MaryEllen Crowley of Berkeley Floral Supply wraps up an order from a customer. The Exchange was operating seven days a week for the past several days to keep up with wholesale flower orders for Valentine’s Day. A wall of red roses lined just about every stall at the market on Monday. It was the last big wholesale buying day for florists all around New England. Some nine wholesalers at the New England Flower Exchange on the Chelsea/Everett line celebrated their first Valentine’s Day in the new location this week. Janina Cupp, market manager, said they move from Boston’s South End to the Chelsea/Everett line has been very positive, despite initial concerns from many wholesalers. Elgreen Orchids owner Jeff Kim said as a specialist, the move has been hard on his business, but things are starting to turnaround. The new facility is much easier for keeping his colorful orchids though. After having worked in Boston schools, and having also served on the Chelsea School Committee, Lisa Lineweaver is bringing her talents this year to the very school where her own kids go – the Kelly School. Joining Principal Maggie Sanchez, Lineweaver came on earlier this summer as the new assistant principal at the school – coming over after having worked in the same role at the Blackstone Elementary School in Boston’s South End for seven years. Now, she’s back on this side of the Mystic/Tobin Bridge, and enjoying the idea of working where she lives – ready to welcome students back to school this coming Tuesday, Aug. 29. One interesting new experience for Lineweaver, whose husband is former Councillor Brian Hatleberg, is that she has also been a parent at the Kelly. Both of her daughters have attended the Kelly, with Holly moving on to the Browne Middle School this year. However, Hazel is still at the Kelly and going into the third grade. Beyond that, Lineweaver also brings the experience of having served on the Chelsea School Committee for eight years – just a few years ago leaving the seat. She said that is an experience that helps her see beyond the four walls of the school building, and to bring a birds-eye view of the district and all of its moving pieces to the building. Lineweaver completed her graduate degree from the Harvard School of Education in 2001 and worked for the Boston Plan for Excellence eight years before taking the job at the Blackstone. Now, being home feels rather comfortable after so many years working elsewhere, she said. “It feels like joining a community I have one or two feet in already,” she said. Classes start for schools throughout the district on Tuesday, Aug. 29. A Chelsea man who once worked at the scene of a brutal double homicide in South Boston was ordered held without bail at his Suffolk Superior Court arraignment for the murders of Lina Bolanos and Richard Field on Monday, July 10. Bampumm Teixeira, 30, was indicted June 28 and arraigned Monday on two counts each of first-degree murder, armed robbery, and kidnapping by confinement, and one count of armed home invasion for the May 5 incident at 141 Dorchester Ave. in Southie. At the request of Suffolk Chief Trial Counsel John Pappas, Clerk Magistrate Edward Curley ordered Teixeira held without bail. Conley’s chief trial counsel, Assistant District Attorney John Pappas, told the court that Teixeira had previously been employed as a concierge at the South Boston building where Bolanos, 38, and Field, 49, lived on the 11th floor. As such, Teixeira was familiar with the interior of the building as well as its parking garage. Pappas told the court that a person wearing gloves, a hat, a hooded jacket, and a bright yellow shirt and carrying a string-style backpack was in the area of the building as early as 2:40 that afternoon and snuck into the garage shortly before 4 p.m. Bolanos entered the building at about 5 p.m. and Field at about 6:30 p.m. 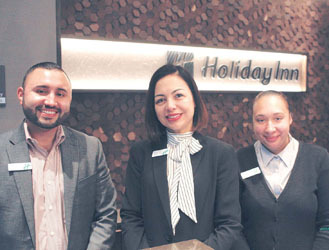 Shortly after 8:30 p.m., the concierge at the building’s front desk contacted Boston Police to report a call he had received from a friend of a resident. The concierge reported that this friend had received a text message from Field telling him to call 911 for a man armed with a gun in his home. This same friend moments later called Boston Police directly and recounted the same plea for help. Officers responded to the scene and proceeded to the 11th floor, where they observed a set of keys on the floor in the hallway outside the victims’ door. After knocking, announcing themselves, and receiving no response, they used the keys to access the residence. After announcing themselves once again inside the darkened residence, one of the officers spotted an unknown person later identified as Teixeira dressed in dark clothing, and – believing this person either pointed or fired a weapon at them – two officers discharged their own weapons, injuring him. The officers provided first aid to Teixeira, who was wearing gloves, outside the apartment. He allegedly stated that another person would open fire on the officers if they went back inside. Teixeira was transported to Tufts Medical Center and a Boston Police entry team made its way into the residence. Inside, officers found the Bolanos’ and Field’s bodies in separate areas; they had been bound, suffered massive traumatic injuries, and were declared dead at the scene. Just outside the apartment, where Teixeira had been apprehended and briefly treated, homicide detectives found a string-type backpack containing a replica firearm, personal property belonging to the victims, and other items. In the immediate vicinity of the bag were a bright yellow shirt and a large carving knife. Just inside the door was a second backpack containing jewelry belonging to Bolanos. Katherine Moran is the DA’s assigned victim-witness advocate. Teixeira is represented by attorney Steven Sack. The case returns to court on Sept. 12. The Chelsea Zoning Board of Appeals (ZBA) approved a special permit and variances that pave the way for the newest culinary advancement in the City – with the owners of Ciao Pizza and Pastas moving forward to open a small plate lounge that will serve alcohol and gourmet foods. The proposal by Edson Coimbra and Marvin Posada, owners of Ciao, completes a recent aggressive expansion by the gourmet pizza parlor on Williams Street. The Lounge will be on the first floor of a new building at the old location of Parrotta’s Bar. Coimbra lined up many supporters who came to speak on behalf of the owners and their vision for the space, which does include a bar, but not the kind of rowdy bar that the space was known for when Parrotta’s occupied it. Some abutters have not been happy with the plan as they believe it could re-ignite troubles at the location that existed when the old bar was there. Coimbra has said he plans to bring an upscale dining experience similar to the small plate restaurant Barcelona in the South End. With their approvals in hand, Coimbra said they would begin work on the new restaurant hand in hand with the development of the dwelling units. Meanwhile, Ciao is nearly complete with the build out of a gourmet grocery and pasta factory at a space in Chelsea Square. The 45-unit apartment building proposed at 170 Cottage St. was continued once again. Variances and a special permit were granted at 157 Clark Ave. for an awning for a store and an increase in the parking lot from 14 spaces to 28 spaces. A cell phone store was okayed at 364 Washington Ave. Combining two lots was allowed at 25-27 Suffolk Street in order to build a new four-family dwelling. A minor modification was granted to a dental office at 950 Broadway for extension of office space. A minor modification was granted to the car wash at 284 Eastern Ave. to use another building. A sudden and controversial plan to potentially demolish the McKinley South End Academy on Warren Avenue in the South End and build a new 4-6 story school to house the Josiah Quincy Middle and High Schools has been shelved for the time being in order to get more input from faculty, parents and – most importantly – the community. The plan surfaced in small pieces over the summer, but really emerged this fall in the neighborhood as those from the Ellis South End Neighborhood Association began to get details of the plan through working in a relatively new friendly partnership with the McKinley community. A preliminary plan discussed was to build the new, much larger school on the site of the McKinley South End – which houses a very vulnerable special needs population, many of whom suffered severe trauma – and then move McKinley students into a facility on Columbia Point in Dorchester. To date, Ellis members said there has not been any community meeting with them about what could be a very inconvenient and neighborhood-changing school building project. The Sun previously reported that a deadline of Sept. 29 had been imposed on the Boston Public Schools (BPS) to present a plan to the state School Building Authority (MSBA) in order to advance the Quincy School project to the next stage of the planning process. The end result of that was BPS asking for a delay. In a statement, BPS told the Sun they needed time to review the project with the community, and that any project involving the Quincy School and McKinley Schools would be run through the existing 10-year Facilities and Education Master Plan that is currently being conducted. That process is expected to start having reports on the educational aspect this week, and facilities projects within that plan would be unveiled later in the fall. Neighbors abutting the project have been flabbergasted by the lack of information and communication given to them on what would be an extraordinary change to their properties, many of which would have had their views and sunlight blocked. Betsy Hall, an abutter who also happens to be president of the Ellis South End, spoke as a abutter said she was disappointed that the City hadn’t yet reached out to the neighborhood or the abutters. She also said she was relieved that the brakes have been put on for now. A facilities proposal, based on several community meetings last spring and summer, is expected to be presented to the Boston School Committee this fall. Any project or proposal including the Quincy School or the McKinley South End would be included, or not, in that 10-year plan. The 2016-17 South End Writes series will include debut novelist and baker Louise Miller (The City Baker’s Guide to Country Living); Dina Vargo (Wild Women of Boston) and the culinary luminary Gordon Hamersley. Tuesday, October 25: Louise Miller, a Boston-based writer and pastry chef who won a scholarship to GrubStreet’s Novel Incubator program, will read from her debut work of fiction, ‘The City Baker’s Guide to Country Living,’ published this summer by Viking’s Pamela Dorman Books imprint. Tuesday, November 22: Just in time to get advice about Thanksgiving’s feast, the beloved and greatly missed South End culinary luminary, Gordon Hamersley, will talk about his life as a prize-winning chef, current food writer for the Boston Globe and long-time neighborhood fixture. Calling him a “refreshing change” in “the current environment of extreme political polarization”, Banker & Tradesman has endorsed John Keith for Suffolk County Register of Deeds. “A seasoned Boston real estate agent, Keith has a general familiarity with how the Registry operates and seems genuinely eager to learn what he doesn’t know,” read the endorsement. John Keith is a Massachusetts native, a graduate of Northeastern University, and a long-time Boston resident. He has been a real estate broker for the past 14 years. He has a background in management, and experience in accounting, software implementation, and data and business analysis. The election for Suffolk County Register of Deeds is on November 8, 2016. Mayor Martin J. Walsh has announced that the annual Fall Pumpkin Float returns to the Boston Common Frog Pond on Sunday, Oct. 23, from 4:30-6:30 p.m. Hundreds of illuminated jack-o’-lanterns will be floated on the water accompanied by spooky family activities. Attendees are asked to bring 8-inch or smaller carved pumpkins that will be lit and then floated on the Frog Pond for a dramatic early evening display. In addition, attendees are invited to view creatively carved and decorated jack-o’-lanterns from various local sports teams and organizations. Adults and children are encouraged to wear Halloween costumes and participate in a wide range of fun activities. Children are invited to decorate luminary bags which will be displayed and illuminated along the edge of the Frog Pond. Test your courage and problem-solving skills in our haunted zombie maze. This free family-friendly event will also include a magician, a visit from the L.L. Bean Bootmobile, children’s crafts, an IKEA selfie booth with LATTJO costumes and sweet treats to try, games and giveaways by Magic 106.7, and scarily delicious snacks and refreshments provided by IKEA, Capital One Café, HP Hood LLC, and DAVIDsTEA. All pumpkins will be donated to The Trustees of Reservations after the event for composting. For more information, please call the Boston Parks and Recreation Department at (617) 635-4505 or visit www.facebook.com/bostonparksdepartment or www.boston.gov/parks. The Fenway Community Center has booked several special events over the next several weeks. The Center is located at 1282 Boylston St. and the phone number is (857) 246-9053. Social dancing on Mondays and Wednesdays from 1:20-3:20 p.m. at the Center, mostly with Chinese music and frequented by Chinese elders, though all are welcome. Student Volunteers – The Fenway Community Center is calling on Northeastern University students who will be living off-campus this fall to volunteer at the Center. Greeters are needed for a one-hour weekly commitment. Volunteers who serving 11 hours or more in a three-month period will be invited to the FCC Ice Cream Social as an appreciation. For more information, contact hello@fenwaycommunitycenter.org. Welcome to the Neighborhood for Northeastern University students who might be interested in the Fenway Community Center. The group will meet every month on the first Thursday, starting Oct. 6. Councilor Josh Zakim District 8 Fall Community Night will take place on Thursday, Oct. 13, at 6 p.m. at the FCC. Pizza and refreshments will be provided. Hayes Park is having a Silent Auction Fundraiser on Thursday, October 20, from 6-8 p.m. at Woodmeister Master Builders, 1317 Washington Street. Tickets available online. BRA Director Brian Golden is confirmed to return to the South End Forum at its Nov. 1 meeting, according to Steve Fox, moderator of the Forum. Golden spoke at length during the September Forum meeting, and many questions remained when time ran out. He will be back to continue the conversation. Old Dover Fall Social, Join Old Dover Neighborhood Association for a Fall Social at LaMotta’s Restaurant, 1357 Washington St., on Tuesday, Oct. 11 from 6-8 p.m. Complimentary apps and a cash bar. Bed Bugs! South End librarian Matt Krug has organized a seminar on Thursday morning, October 6, at 10:30 a.m. on the subject of bed bugs. Yes, bed bugs appear to be a problem in the South End. The speaker is Jonathan Boyar an associate certified entomologist and pest control operator with many years experience. For details, call 617 536-8241. The Golden Age Center and Castle Square Tenants Organization are partnering to bring valuable information to educate residents and the community regarding retirement planning. The SHINE program will present a retirement planning workshop on Monday October 17, 6-8 p.m. in the Castle Square Community Center on the 2nd floor (476 Tremont St.). The workshop will be conducted in English and Chinese. Refreshments provided. Please contact Xiaoping Wang with any questions at 617-357-8548. The 48th Annual South End House Tour has been set for Saturday, Oct. 15, from 10 a.m. to 5 p.m., Lauren Prescott of the South End Historical Society told the Eight Streets Neighborhood Association on Tuesday, Sept. 13. The tour this year will feature six homes in the Pembroke Street area that will showcase a variety of styles in the South End, from three-story condos to majestic Brownstones to historic notables. The South End Historical Society is located at 532 Mass Ave. and is interested in getting volunteers to help as “sitters” during the home tour. Chelsea residents Jay Paris and Anna Myer watch their art come to life in a recent performance of ‘Invisible: Imprints of Racism,’ at Ramsay Park in the South End near the Lenox Housing Development. When audiences leave the most recent performance by the BeHeard.World dancers, they don’t usually leave with a smile on their faces, but rather, this summer, they typically leave thinking very hard about serious issues involving race. Anna Myer and Jay Paris, who live in the Spencer Lofts in Chelsea, have been touring all over Boston this summer performing on lighted basketball courts their newest dance and poetry work called, ‘Invisible: Imprints of Racism,’ on basketball courts and next to gritty housing developments. Paris and Myer moved to Chelsea about one year ago from Cambridge and continued their work in Boston, mostly at the housing developments in Franklin Field (Dorchester) and Lenox (South End). Most recently, last month, they performed the piece on the basketball court at Ramsay Park near the Lenox development, a park long in need of a makeover and, at times, quite dangerous for young people. It’s the kind of place they want to be, though. Myer has a dance and poetry company that performs the works like ‘Invisible,’ using nine dancers and four poets. Meanwhile, Paris works another program that brings youth into the program and helps them to discover their voice in the arts. He has been filming that experience and expects to release a documentary on it in January. The film focuses on the first 19 kids that they took into the program and the changes that came about after they were immersed into the arts programming. Myer came to meet Paris through a tragedy in her life that changed her direction totally. After growing up trained as a ballet dancer and dancing at Boston Ballet and others for a time, she established several smaller and successful companies. That, of course, also led her to Paris, and the both of them to Chelsea one year ago this week. “I feel like there’s great potential for arts here,” said Myers. “I love that it is it’s own city. It’s like stepping back in time and it’s diverse and has its own unique character. The ‘going’ part could very well be sooner than later, as both said they feel the ‘Invisible’ piece could be something that tours the country on basketball courts and fields all over America – taking the temperature of the nation on race. “We’d love to have an organization that gets people thinking and have a movement where change happens,” said Myer.